For Honda CBR400 NC23 Tri-arm. Pair of used HRC style short air trumpets. For Honda CBR400 NC23 Tri-arm. Silver anodised alumnium clipons as used on our championship winning race bikes. Replacement tubes available. For Honda CBR400 NC23 Tri-arm. A budget alternative to the aluminium clipons - mild steel powdercoated black. For Honda CBR400 NC23 Tri-arm. Replacement 270mm alloy tubes for the aluminium clipons. For Honda CBR400 NC23 Tri-arm. 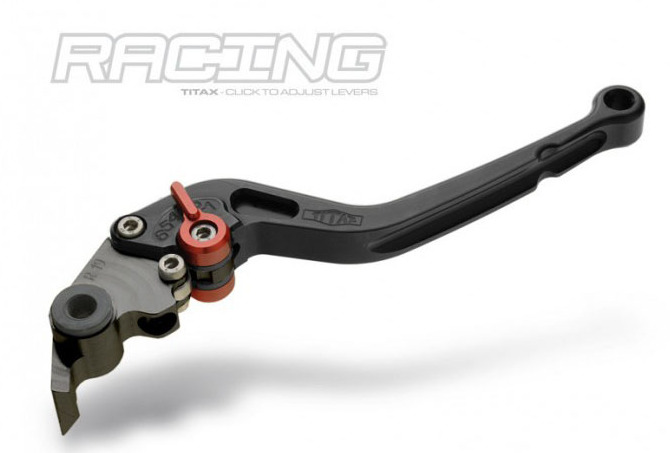 Titax ultra ligthweight aluminium short clutch lever with 6 levels of instant click adjustment. Fits all GF Racing cans. For Honda CBR400 NC23 Tri-arm. GF Racing stainless steel 3 bolt flage to 50mm slip on adapter - comes with clamp. For Honda CBR400 NC23 Tri-arm. Pattern replacement 6mm exhaust studs. For Honda CBR400 NC23 Tri-arm. Keyless aluminium filler cap - uses existing base fitting bolts. Genuine HRC replacement header bottle. Quick release 8mm fuel line coupler as used on our championship winning race bikes - perfect for quickly removing your tank. For Honda CBR400 NC23 Tri-arm. GF Racing quality CNC rearsets as used on our race bikes. For Honda CBR400 NC23 Tri-arm. Clear double bubble screen from Skidmarx - the most popular screens in the UK. Skidmarx nylon screen screws as used in our championship winning race bikes. For Honda CBR400 NC23 Tri-arm. 42 tooth 520 pitch Renthal sprocket. Renthal rear sprockets are made from high strength enhanced aluminium alloy. For Honda CBR400 NC23 Tri-arm. Thermostatically controlled tyre warmers with a top temperature of 80° C - perfect for track days and racing.